Mango. © 2006 Peggy Trowbridge Filippone, licensed to About.com, Inc.
Mangoes are the super sweet stone fruit of tropical trees cultivated largely in warm subtropical regions around the world. The English singular form mango comes from the Latin Mangifera indica meaning mango-bearing plant from India. The mango is a member of the Anachardiaceae family which includes poison ivy, cashews, and pistachios. It is also known as manga, mangga, mangot, mangou, and mangue in other parts of the world. Mangoes have been grown in South Asia for many thousands of years and reached East Africa and subsequently around the world. Today, it is grown in Brazil, Mexico, the West Indies, and Bermuda, India still reigns supreme, accounting for almost half of the world's mangoes, while China stands as the second largest producer of mangoes. Native to southeast Asia and India, the mango is purportedly the most widely consumed fresh fruit in the world, with worldwide production exceeding 17 million metric tons a year. Mexico is the largest exporter of mangoes in the world. Haden: An Indian mango, is said to be one of the tastiest mango varieties. 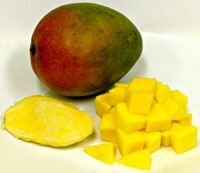 Popular as a variety to grow on your own, this mango cultivar was introduced in Florida in the early 20th century. Tommy Atkins: This purple/red mango has a long shelf life and doesn't dent or bruise easily. It is more economical to import and therefore comprises about 80% of mangoes sold in the United Kingdom and the United States. Ataulfo Mango: Named after grower Ataulfo Morales Gordillogolden, these are yellow and generally weigh between 6 and 10 ounces, with a thin pit and a savory sweet flavor. Mangoes are oval-shaped and have a flat pit directly in the middle of the fruit. When you cut the mango into thirds, you'll cut two parallel slices on either side of the pit in the middle, which is about ¾ of an inch thick depending on the size of the mango. The two edges of the mango that you cut off are called the cheeks. You don't need the middle section you cut out. When cutting the cheeks, you'll use a serrated knife to "cube" the cheeks by making lengthwise and crosswise cuts. Each cut should be about ½ inch apart, and the cuts should not go through the skin. Once each of your cheeks has been cubed, use the rim of a short glass to slide the cubes away from the skin. If you live in a warm climate, you can easily grow your own.